Playing career: Bill Bray pitched for the Nationals and Reds from 2006 to 2012. In 258 games he went 13-12 with 3 saves and a 3.74 ERA. 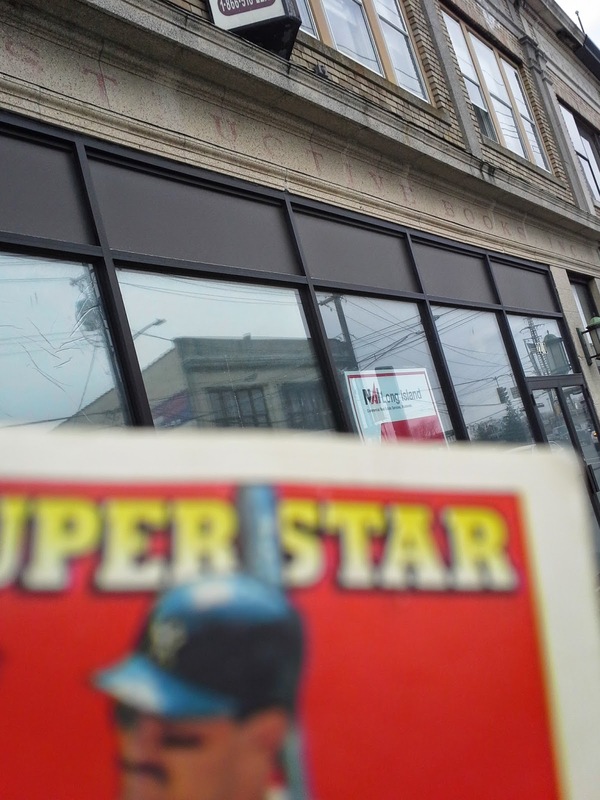 Now a pitching instructor at Colonial Baseball Instruction and Jamestown High School in Virginia, and a columnist for The Sporting News, he kindly answered my questions about baseball cards. 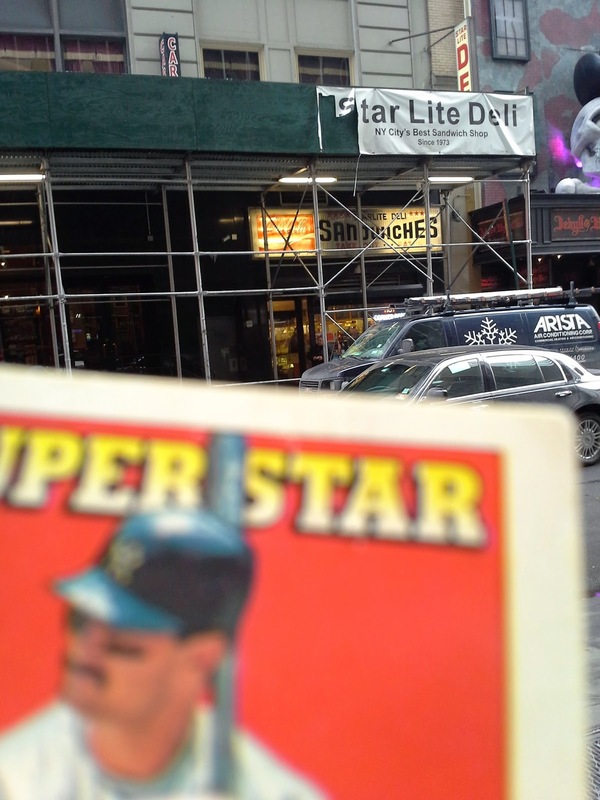 "If I remember correctly, every player when they sign gets a deal from Topps and a royalty check for $5. If they produce a card, you get another check sometime after that. I was so excited to have my first card. 2004 Topps. About 10 years earlier, I had made a deal with a family member involving baseball cards. 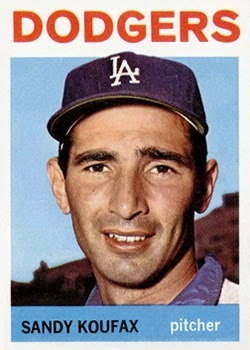 My hero is Sandy Koufax and my uncle had a nice 1964 Topps Koufax. I wanted it so bad and he made the deal that once I had a card of my own, he would trade me for the Koufax. I will never forget trading my card for his Koufax. My Uncle framed the card with one of my jerseys and it's hanging in his game room. 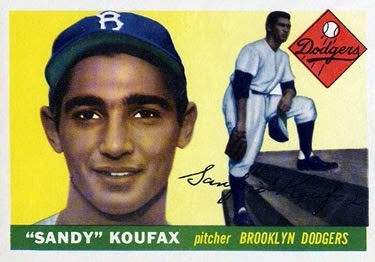 My favorite card of all time is the 1955 Topps Sandy Koufax Rookie. Just a beautiful card. One of my goals in life is to own a PSA 10 version of it. My favorite card of myself is the 2007 Topps with the yellow background. I like it because of the cartoon on the back. The cartoon suggested that I was popular with the ladies in college, which is so far from the truth. That and the card is a throwback, which I love. I’m still collecting. Mainly older cards now. I have been putting together sets from the early sixties and have almost complete sets from 1964 and 1965. I am picky about which cards I buy, so it is a slow process. I also have complete 1971, 79 and 83 sets." 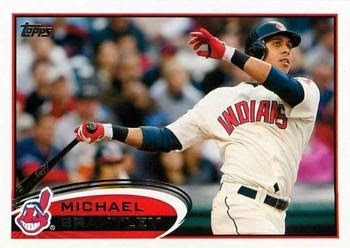 I have one card of Michael Brantley, from 2012 Topps. Playing career: Outfielder Michael Brantley came up with the Indians in 2009 and was a regular in their lineup by 2011. Through the 2013 season he was solid but far from spectacular, with career highs of .288 batting average, 10 HR and 73 RBI. Where he is now: 2014 was his age-27 season, and like many players that age he had a career year, hitting .327 with 20 HR and 97 RBI. Interesting facts: His father, Mickey Brantley, played for the Mariners in the 1980s. 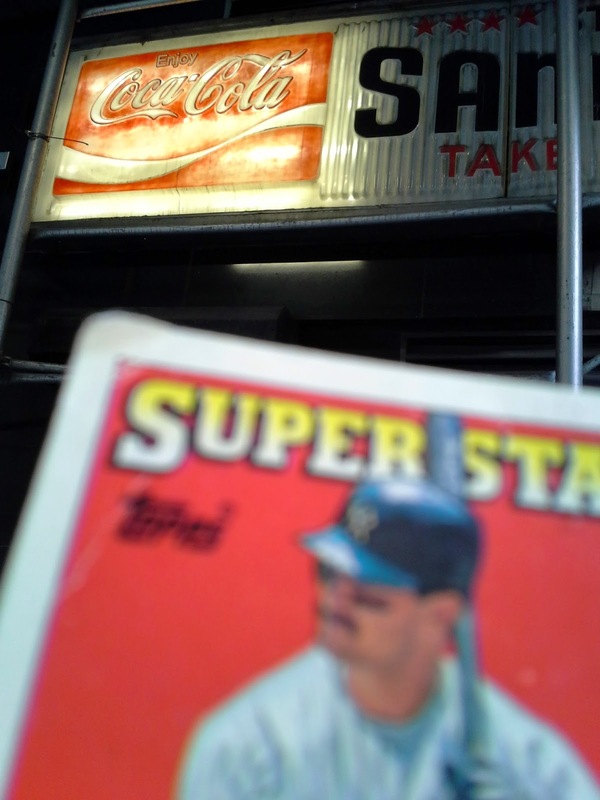 My memories: I only knew of him as a run-of-the-middle outfielder whose father was in all the junk wax sets. I was quite surprised to see him third in the MVP voting this year. Probably the most under-the-radar star in the American League. Google Autocomplete results: He is third when you type Michael Br, between Michael Brown Video and Michael Brown Facts, referring to the highly-publicized police shooting in Missouri. There do not appear to be any other prominent Michael Brantleys. Coming up next: The next profile will be Mickey Brantley. Bickford's restaurants were cafeteria-style eateries, basically one step up from fast food, from the 1920s to the 1970s. 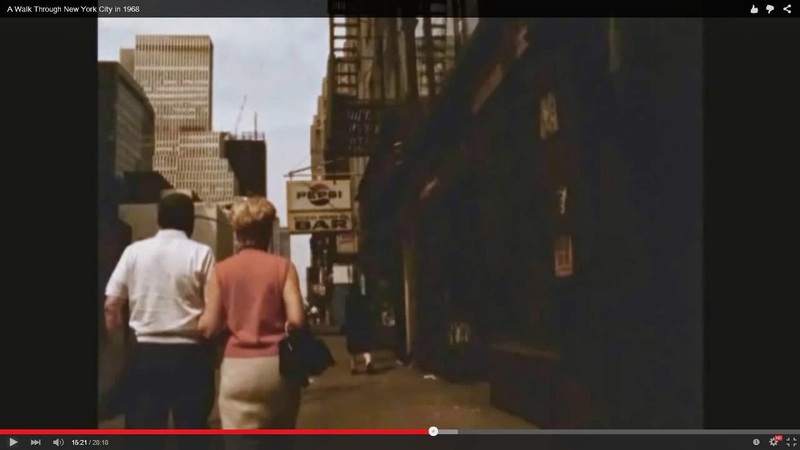 The Bickford's pictured here, at 488 Eighth Avenue, went out of business in the mid-1960s, as rising crime in the city deterred the late-night crowd that was a key part of Bickford's success. 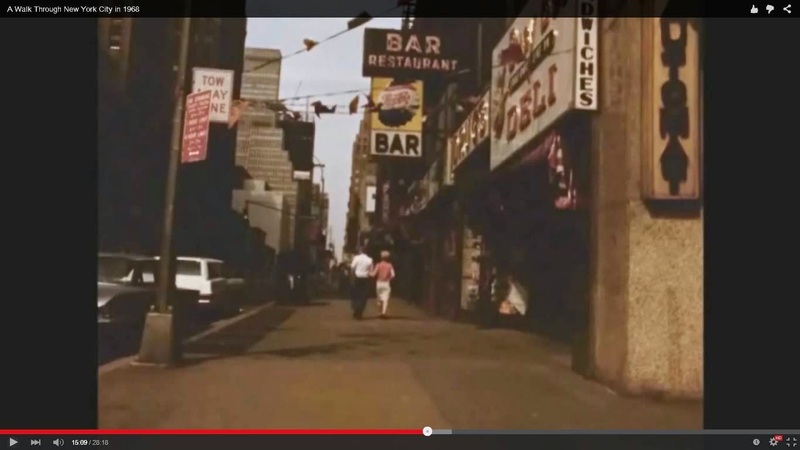 After Bickford's the location was home to a restaurant called Snacktime and then an adult book store. The Bickford's facade was revealed followed by the removal of the adult store's sign when it closed in 2000, and it remains to this day, with the building's current tenants, a pizza place and a hair removal spa. In the 1950's Bickford's expanded into New England, and to this day there are still several of them around, mostly in Massachusetts, operating more as pancake houses. Also, the pawnbroker next to Bickford's in the photo, which also has a pretty cool old sign, has been in business at that location since 1901! I have 62 cards of Jeff Brantley. This one is from 1992 Ultra. 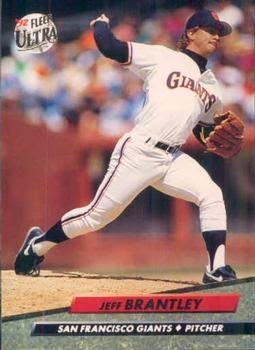 Playing career: Jeff Brantley pitched fourteen years in the major leagues, mostly for the Giants and Reds. In 615 games he went 43-46 with 172 saves and a 3.39 ERA. In 1996 he led the national league with 44 saves for the Reds. My memories: I remember him vaguely as a pitcher for the Giants. I had actually forgotten he was a reliever and not a starter. I think I would confuse him with John Burkett. Google Autocomplete results: He is ninth when you type Jeff Bra, between Jeff Brameier, lacrosse coach at Darien High School in Connecticut, and Jeff Brandes, a Florida state senator. Another Jeff Brantley is a psychiatrist at the Duke Department of Psychiatry. Coming up next: The next profile will be Michael Brantley. Johnny kindly sent me a medium flat-rate-box jammed with minor league cards he was looking to get rid of. Tons of variety in what he sent me which I love. I don't want to imply that he sent me a bunch of junk, though. There were a ton of really cool cards that I am keeping for myself, like super-shiny inserts from Classic. Lots of 1989 Star, a set I enjoy and don't have much from. Here's a Jerry Nielsen error card. Also more recent stuff like Just 2K, with its' weird border design. I've become so interested in old signs that have survived their business that I have been keeping an eye out for them as I drive around Long Island. I noticed this sign for "Instructive Books Inc." on this empty storefront on Grand Avenue in Baldwin this weekend. They apparently sold encyclopedias and dictionaries. The most recent mention that I can find via google is an ad from 1949. I imagine the company is long-defunct but 66 years is an awful long time for no one to have painted over the sign. Anyone know of a way to research when the company did actually go out of business? I have sixteen cards of Cliff Brantley. 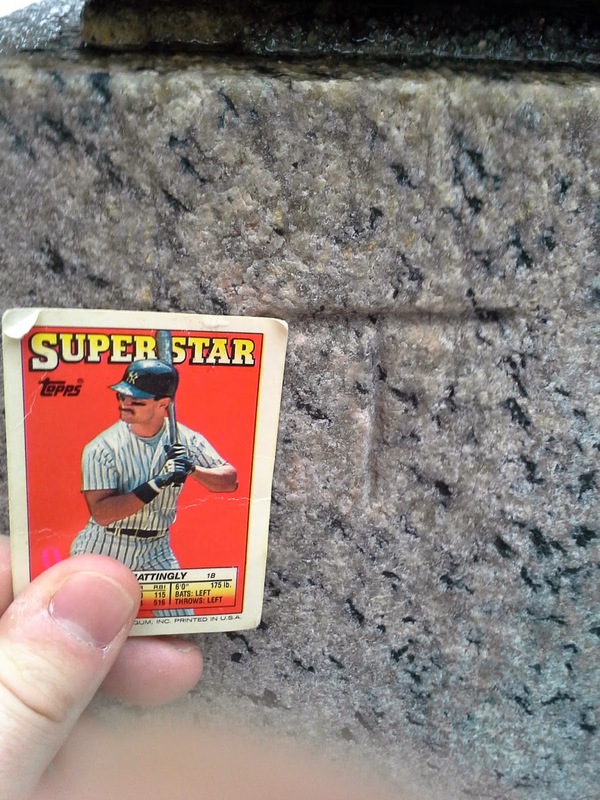 This one is from 1992 Donruss. 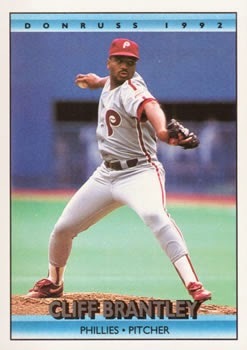 Playing career: Cliff Brantley pitched for the Phillies in 1991 and 1992. In 34 games he went 4-8 with a 4.25 ERA. Interesting facts: His son, Cliff Brantley Jr., was drafted by the Blue Jays in 2014 and played in their system last year. Where he is now: Anyone know where Cliff Brantley is now? Google Autocomplete results: He is third when you type Cliff Br, between Cliff Brokaw, Managing Director of Corsair Capital, and Cliff Briggie, an artist. There do not appear to be any other prominent Cliff Brantleys. Coming up next: The next profile will be Jeff Brantley. 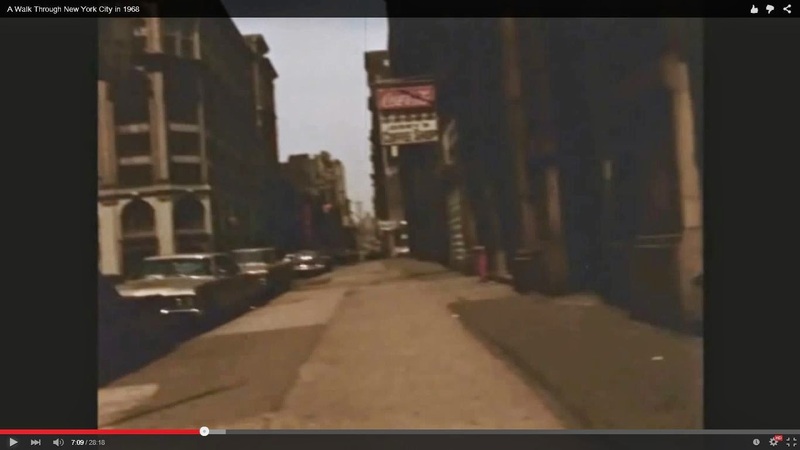 In the last couple of years I have become very interested in pictures of New York from the 1950s-1980s, a time where everything is somewhat familiar but also somewhat different, almost like an alternate reality. 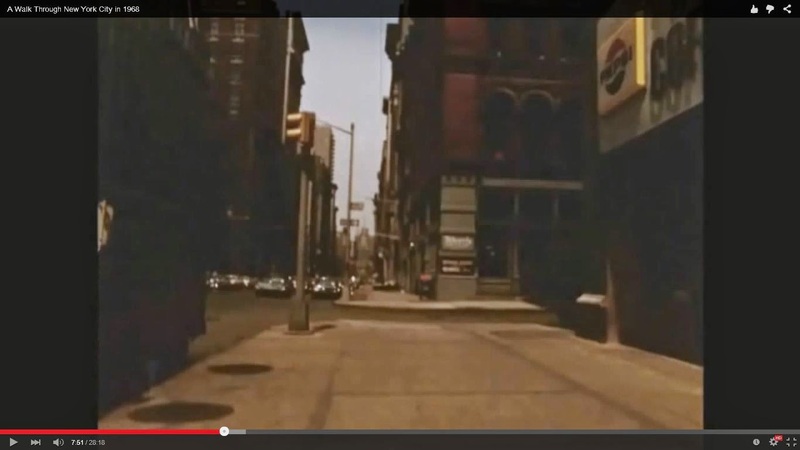 My favorite find so far has been a YouTube video called A Walk Through New York City in 1968. 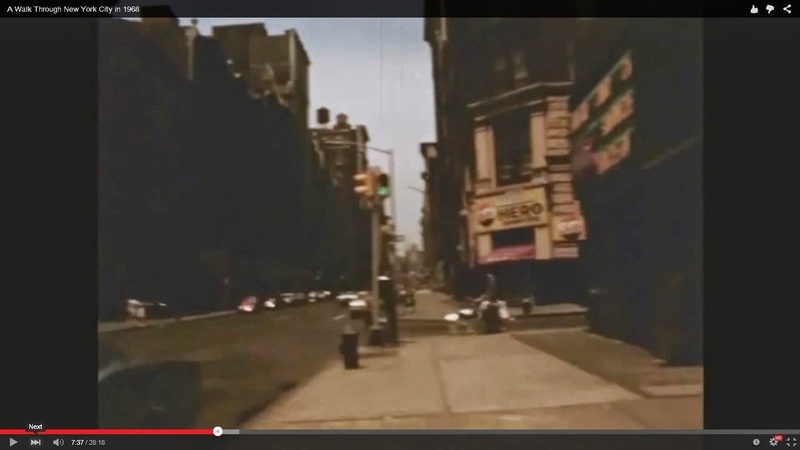 In 1968 for a student film someone took a movie camera and walked all the from Battery Park up Sixth Avenue all the way to Central Park. It was filmed to be seen in fast motion for about two minutes but someone slowed it down so that you can clearly see each block. If you are familiar with New York it really is fascinating to watch. 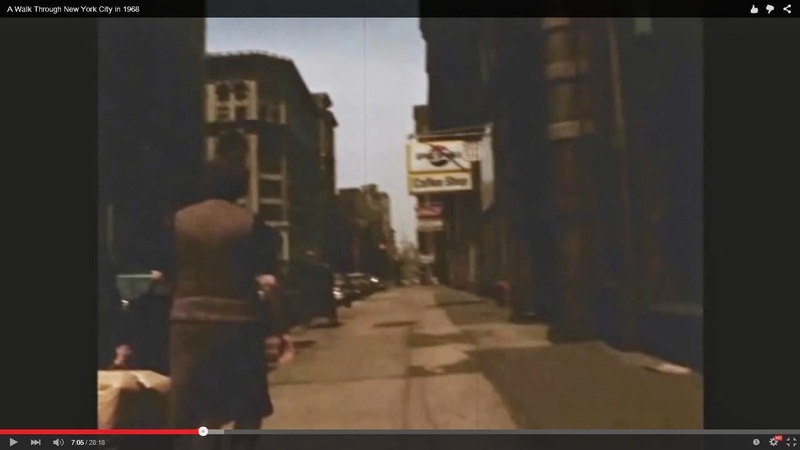 One thing that struck me watching the video was that you would see on every couple of blocks a luncheonette, pizza place, bar, etc., with a big Pepsi-Cola sign. I included some screen caps below to give you an idea. I did some research and it turns out they were called privilege signs, and they were given to stores around the country by Pepsi, Coke, 7-Up etc - free advertising in exchange for them buying a sign. In the 1960s they were still very common across the country, but by the end of the 1970s they started being seen as old-fashioned and most of them disappeared. There are still a few holdouts today - keep an eye out for them in your neighborhood. One New York-area privilege sign still exists in, of all places, Times Square, where little remains from before the 1990s. Unfortunately when I stopped by the Starlite Deli there was a scaffolding, but I got underneath to get a good picture of the sign. I think privilege signs are my new obsession - I am keeping my eye out for them wherever I go, and would love to find out about others that are still in existence. Here are just a few screen caps from the video, you can see a ton of them if you watch the whole thing. I have 27 cards of Jeff Branson. This one is from 1994 Stadium Club. Playing career: Infielder Jeff Branson played nine years in the major leagues, mostly for the Reds. In 694 games he hit .246 with 34 HR and 156 RBI. Google Autocomplete results: He is first when you type Jeff Bra, ahead of Jeff Bradshaw, a musician. The first entry when you google Jeff Branson is not the ballplayer but an actor. Coming up next: The next profile will be Cliff Brantley. Catcher Jayhawk Owens played for the Rockies from 1993 to 1996. In 130 games he hit .232 with 11 HR and 36 RBI. 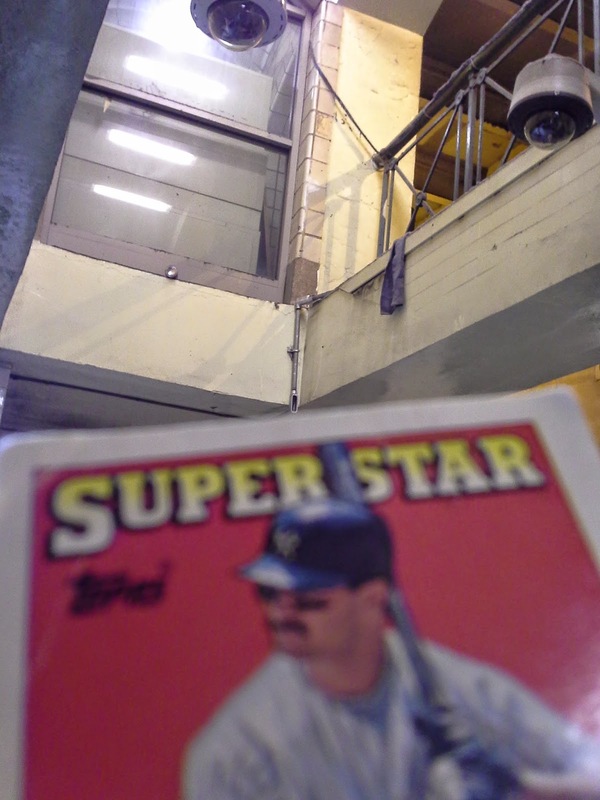 Now a Project Manager at Baker Concrete Construction in Aurora, CO, he kindly answered my questions about baseball cards. "I still have all my cards from when I was age 5-12. I grew up In Cincinnati and was a Big Red Machine fan. Johnny Bench is my favorite card. Every $0.15 I could scrap up, I bought a pack of Topps. I always like action shot cards." The I. Miller Shoe Shop moved into this Times Square building in 1911, and in 1927 the facade underwent a grand overhaul, with four statues by Alexander Calder depicting four leading theatre stars of the time (Rosa Ponselle, Mary Pickford, Marilyn Miller and Ethel Barrymore). The top of the building had the bold proclamation "The Show Folks Shoe Shop Dedicated to Beauty in Footwear". Though the interior was gutted in a fire in 1959 and the building later became a Howard Johnson's, then a TGIF, and is now the clothing store Express, the old I. Miller facade lives on. I have one card of Cliff Brannon, from 1991 Line Drive. 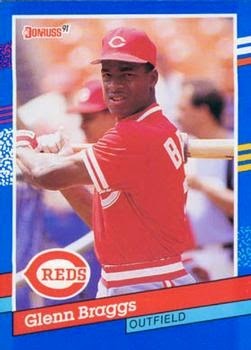 Playing career: Outfielder Cliff Brannon played in the Cardinals organization from 1989 to 1992, hitting .248 with 30 HR and 170 RBI in 436 games. He also appeared in ten games as a relief pitcher in that span, even winning a game in that span. He attempted a comeback as a pitcher in 1995 with the Shreveport Captains, AA team for the Giants, making a start and two relief appearances, allowing six earned runs in ten innings. Where he is now: Pitching coach at Mount Pisgah Christian School in Johns Creek, GA.
Google Autocomplete results: He is second when you type Cliff Brann, between Cliff Branan, an Oklahoma state senator, and Cliff Brannon Jr., a pool service owner in Georgia who died in 2011. Coming up next: The next profile will be Jeff Branson. Bryant Park likes to keep it's famous fountain flowing in all weather, even when it is freezing, which leads to images like this. I would think this would eventually cause damage to the fountain, but I guess they don't mind. I have one card of Ryan Brannan, from 1999 SP Top Prospects. 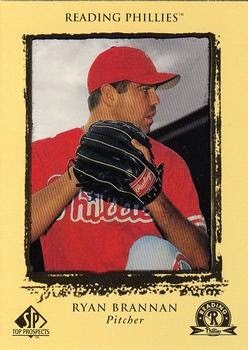 Playing career: Ryan Brannan was the Phillies’ fourth round draft pick in 1996 and seemed to be on a meteoric rise when he had a fabulous 1997 season, going 4-2 with 30 saves and a 2.15 ERA, mostly at AA Reading. However, he struggled mightily with his command the next two seasons, going 10-9 with 8 saves and a 5.03 ERA. He was released in spring training of 2000, ending his professional career. Where he is now: Anyone know where Ryan Brannan is now? Google Autocomplete results: He is second when you type Ryan Brann, between Ryan Brannan QCC, referring to a STEM academy coordinator at Queensborough Community College, and Ryan Brannon, an OBGYN in Philadelphia. The first entry when you google Ryan Brannan is not the ballplayer but a commissioner at the Texas Department of Insurance. Coming up next: The next profile will be Cliff Brannon. Outfielder Roberto Vaz played seven seasons in the A's and Rangers organizations. In 494 games he hit .286 with 35 HR and 249 RBI. Now an assistant coach at McNeese State, he kindly answered my questions about baseball cards. "I have cards. I would love to have a Roberto Clemente card." Thanks! 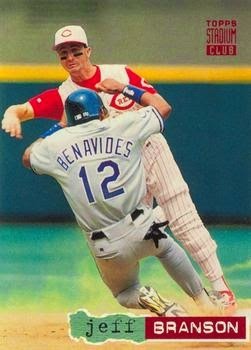 Here is one of his cards, from 2000 Bowman. I have one card of Jelani Brandon, from 1994 ProCards. Playing career: Outfielder Jelani Brandon played in the Royals organization from 1992 to 1995. In 233 games, he hit .254 with 9 HR, 101 RBI and 23 SB. Where he is now: He is currently a software engineer at Microsoft. He previously worked at IGT and Safelite and holds patents from his time at each company. Google Autocomplete results: He is eighth when you type Jelani Br, between Jelani Bratton, a felon in Florida, and Jelani Brooks, a musician in Harlem. There do not appear to be any other prominent Jelani Brandons. Coming up next: The next profile will be Ryan Brannan. You may be familiar with the famous Macy's building on 34th Street, which until a few years ago was the largest store in the world (and is still the largest in the US). Interestingly, the huge red shopping bag that says "Macy's" is on the one part of the block that Macy's does not actually own. 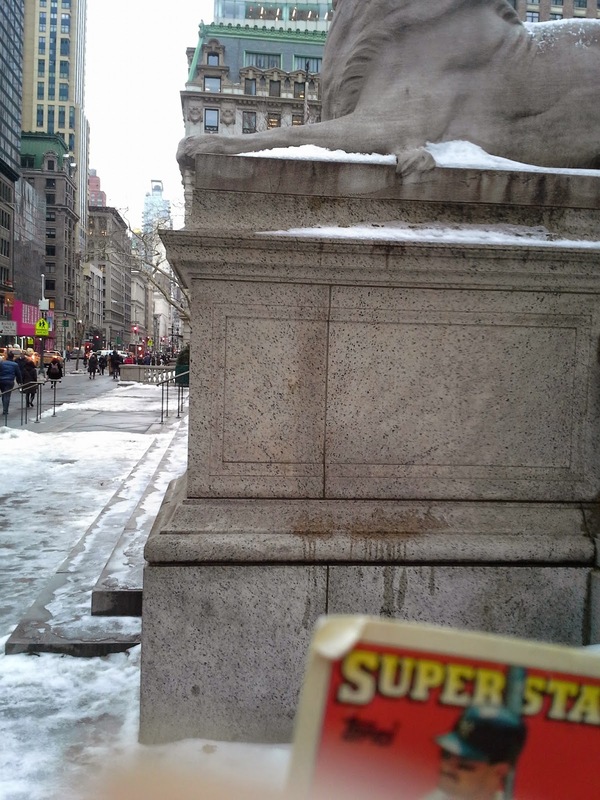 Back when R.H. Macy decided to move his store to 34th street, he quietly started buying up all of the property on the block so that he could build his superstore. However, one of his rivals found out and bought the property on the corner, with the idea that he would sell it to Macy and get a general manager position at the new store. However, Macy decided to just build around the property instead of giving in to the guy who bought the corner property. 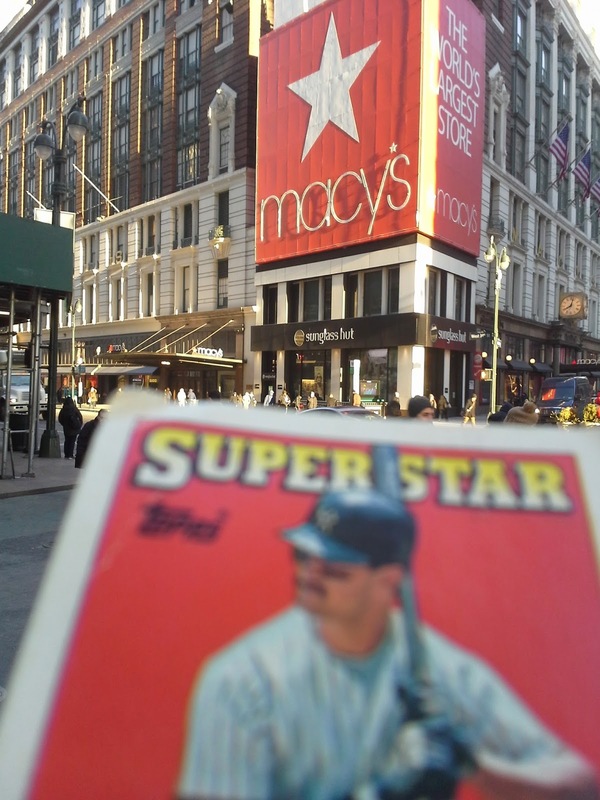 In later years, Macy's would rent the top floors of the building for advertising purposes, but they have never bought that last parcel on 34th street, currently home to Sunglass Hut. I have one card of Matt Brainard, from 1994 ProCards. 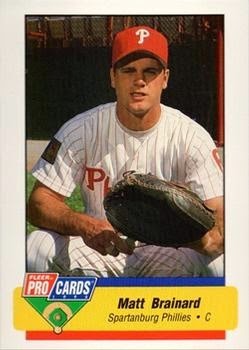 Playing career: Catcher-infielder Matt Brainard played in the Phillies organization in 1993 and 1994. In 114 games he hit .219 with 7 HR and 36 RBI. Where he is now: A guidance counselor and golf coach at Red Clay School in Wilmington, DE. Google Autocomplete results: He is sixth when you type Matt Brai, between Matt Brazis, a pitcher in the Mariners organization, and Matt Brailey, a technology salesman in California. There are not references to the ballplayer on the first page of Google results; the first entry is for a realtor in Los Angeles. Coming up next: The next profile will be Jelani Brandon. Most of Penn Station is pretty bland, but there is a bizarre piece of kitsch in, appropriately enough, the New Jersey Transit section. Titled "New Jersey on Parade", this rotating sculpture shows various scenes from New Jersey history. 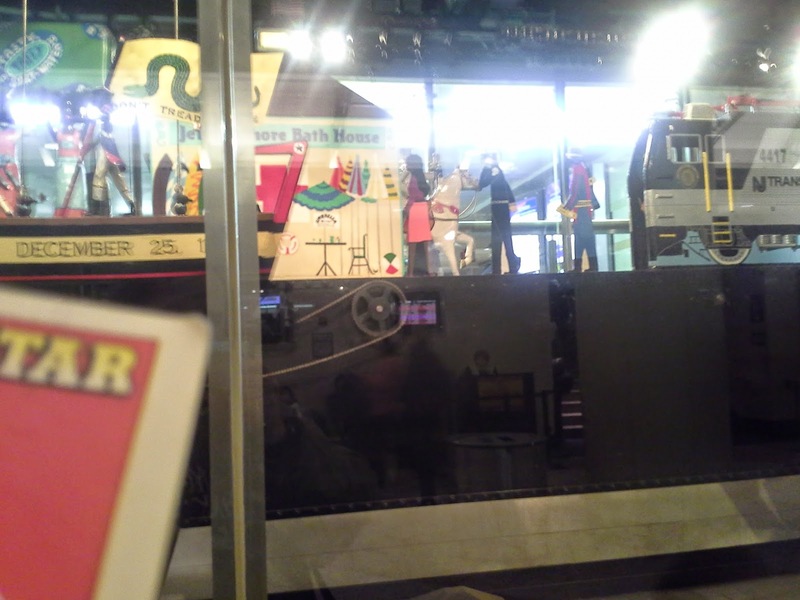 Shortly after its debut, the Bergen Record called it "silly", comparing it to "the machine that sends your pressed suits for a ride in the neighborhood cleaners". Still, anything to break the general monotony of the railroad station. I have 43 cards of Glenn Braggs. This one is from 1991 Donruss. Playing career: Outfielder Glenn Braggs played in 692 games for the Brewers and Reds. He hit .257 with 70 HR and 321 RBI. Thought known as a big, powerful man, he did not hit a lot of home runs (never more than 15 in a season) and struck out a lot. Where he is now: A real estate investor in Los Angeles. Interesting facts: He has been married to Cindy Herron, an original member of the group En Vogue, since 1994. My memories: I remember him from his cards but no specific memories from his playing days. Google Autocomplete results: He is fourth when you type Glenn Br, between Glenn Britt, former CEO of Time Warner Cable, and Glenn Bradford, a jewelry store in Port Washington, NY. Coming up next: The next profile will be Matt Brainard. The New York Public Library is one of the most famous buildings in the city. It regularly has some interesting exhibitions; I should probably bring Mattingly inside at some point. 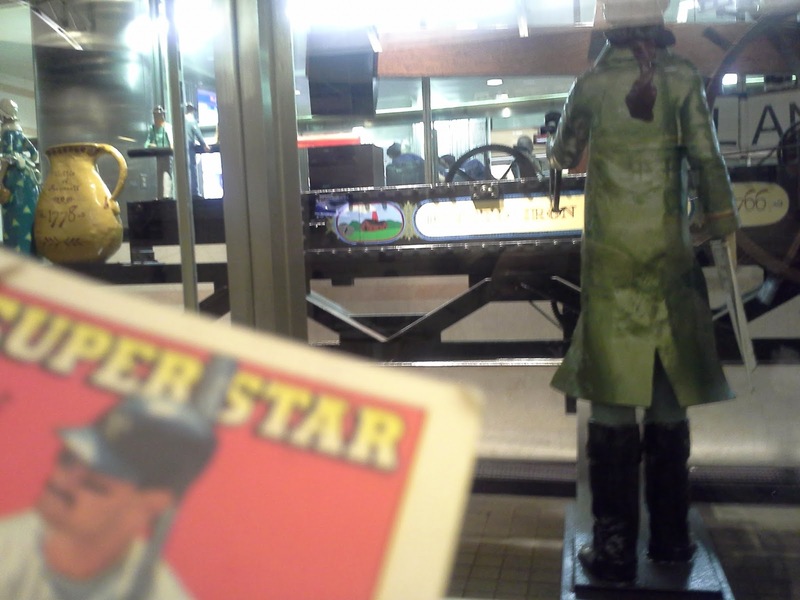 Too bad last year's exhibit of T206 cards, including the famous Honus Wagner card, is over. However, today Wallet Card is showing an obscure part of the library building - it's benchmarks. Benchmarks are a surveying tool known for their high degree of accuracy in location - their exact latitude/longitude coordinates is recorded by the NOAA's National Geodetic Survey. They may be marked by a chiseled cross, metal disk, metal knob, or even a church spire or radio tower. The Geocaching website has a searchable database of over 700,000 benchmarks across the US, so you can have fun searching for benchmarks in your town. The library has two benchmarks hidden in plain view. 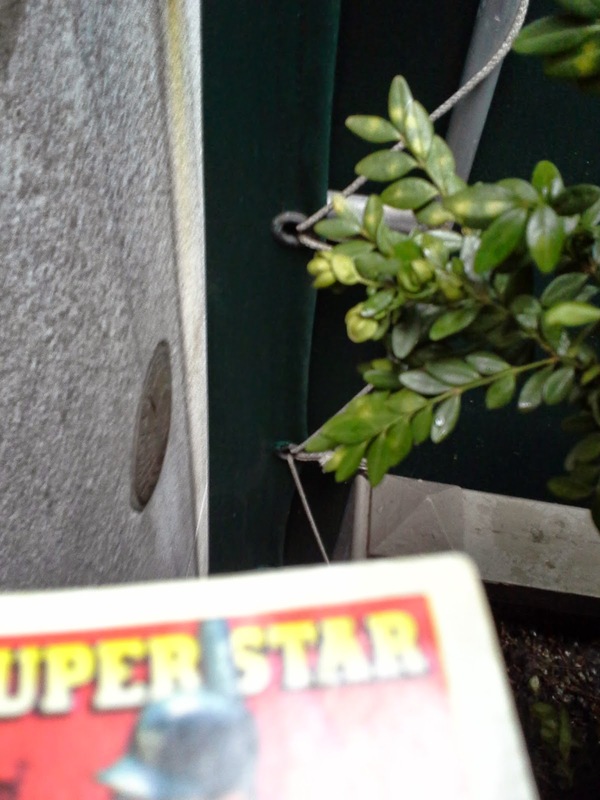 Well, the first one is a little obscured by a bush, but the metal disk is pretty easy to spot nonetheless. A little more subtle is the chiseled cross under one of the library's famous lion statues, Fortitude. Here is a wide shot, much harder to see the chiseled cross on the top left of the bottom section of the pedestal. I have thirteen cards of Darren Bragg. This one is from 1997 Collector's Choice. 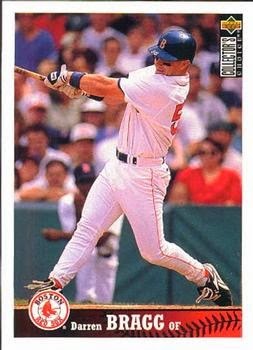 Playing career: Outfielder Darren Bragg played for the Mariners, Red Sox, Cardinals, Rockies, Mets, Yankees, Braves, Padres and Reds from 1994 to 2004. In 916 games he hit .255 with 46 HR, 260 RBI and 56 stolen bases. A fuller account of his career can be found at bdj610’s Topps Baseball Card Blog. Interesting stories: Bragg has had multiple run-ins with the law. As a senior at Georgia Tech in 1991 he was arrested for burglary of an occupied dwelling, stealing a TV, VCR, stereo and compact disc player. And just his past November, he punched an off-duty police officer during a dispute and ended up facing multiple charges, including third-degree assault. Where he is now: Owner of The Hit Club instructional facility in Thomaston, CT.
My memories: I remember him as a speedy outfielder for the Mariners and Red Sox. I have no memory of his (admittedly very brief) time with the Yankees. Google Autocomplete results: He is seventh when you type Darren B, between Darren Bloch, Executive Director of The Mayor’s Fund to Advance NYC, and Darren Boyd, an actor. Another prominent Darren Bragg is a pro golfer. Coming up next: The next profile will be Glenn Braggs. It may not look like much, but this section at one of the entrances to the Seventh Avenue subway is a rare holdover from pre-renovation Penn Station. I have one card of Doug Brady, from 1992 Classic Best. 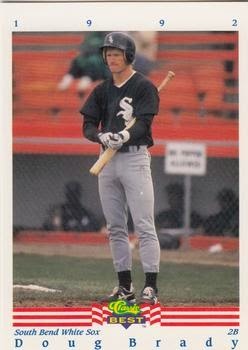 Playing career: Second baseman Doug Brady played for the White Sox in 1995. In twelve games he hit .190 with 0 HR and 3 RBI. Where he is now: Anyone know where Doug Brady is now? Google Autocomplete results: He is tenth when you type Doug Br, behind Doug Brinkley, a historian at Rice University. Another prominent Doug Brady was a tow company owner killed in a dispute in West Virginia in December. Coming up next: The next profile will be Darren Bragg. 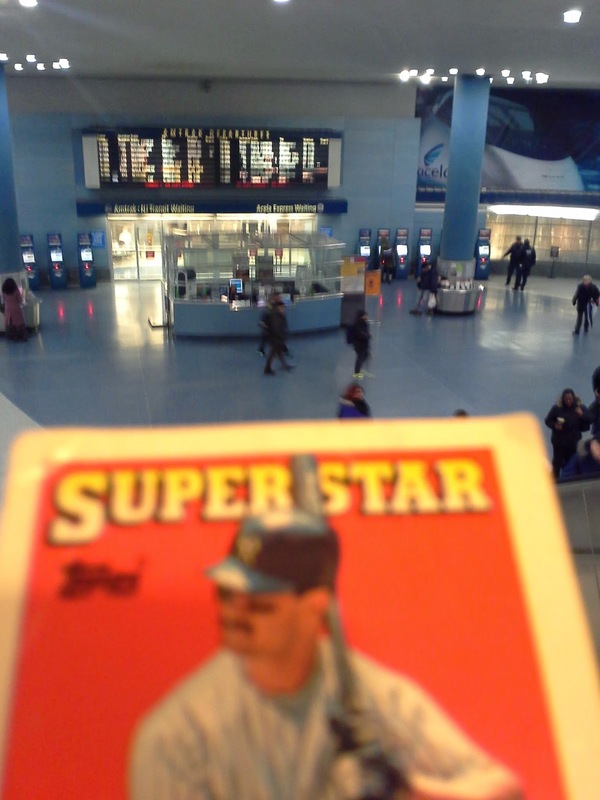 Wallet Card Don Mattingly at the balcony overlooking Penn Station's Amtrak Rotunda, reminding you to take part in Bo's Mega Trade-a-Thon! Don't forget to get in on my mega-trade-a-thon! About ten people are in already but with 25,000+ cards there is room for lots more! I have two cards of Brian Brady. This one is from 1990 CMC. 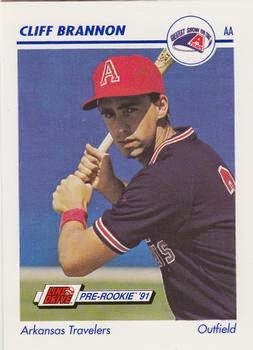 Playing career: Outfielder Brian Brady played in two games for the Angels in 1989. He doubled off of Mike Schooler and struck out against Dennis Eckersley in his two major league at bats. A fuller account of his career can be found at The Greatest 21 Days. Where he is now: A physical therapist at D1 Sports in Texas. Google Autocomplete results: He is fourth when you type Brian Bra, between Brian Brazzo, an oculoplastic surgeon in New York, and Brian Braiker, an author. The first entry when you google Brian Brady is not the ballplayer but an architect in the Hamptons. Coming up next: The next profile will be Doug Brady.